Happy St. Patrick's Day! A couple days late. So, instead, these are St. Paddy's Day cupcakes. 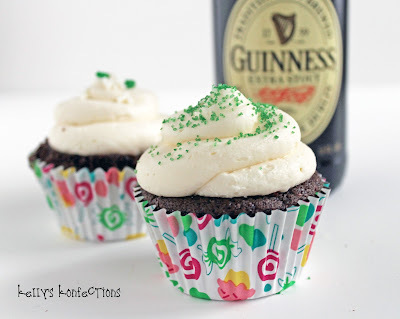 Guinness cupcakes with Irish Cream frosting, stuffed with Guinness truffles. Yum. The cupcakes themselves come from Red Shallot Kitchen, the truffles from Sprinkle Bakes. 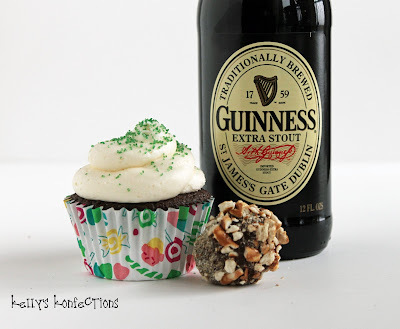 The truffles are great by themselves, but they're fantastic in the cupcakes! 1. Bring Guinness and butter to simmer in a large saucepan over medium heat. Add cocoa powder and whisk until smooth. Cool slightly. 2. Whisk flour, sugar, baking soda and salt in a medium bowl. Set aside. 3. In a large bowl, beat eggs and sour cream. Add Guinness mixture, and continue beating until just combined. Add flour mixture and beat briefly on low speed. Use spatula to fold until completely combined. 4. Divide batter among 2 cupcake tins with liners, filling them 2/3 full. Bake at 350 degrees for ~17 minutes (rotate halfway through). Cool completely. Notes: 1) I used St. Brendan's instead of Bailey's, but either would be fine. 2) I made 1 1/2 times the recipe; the changes are reflected below in parentheses. 1. Cream butter in the bowl of an electric mixer (paddle attached), until it's light and fluffy. 2. Slowly add the powdered sugar (1/2 cup at a time). 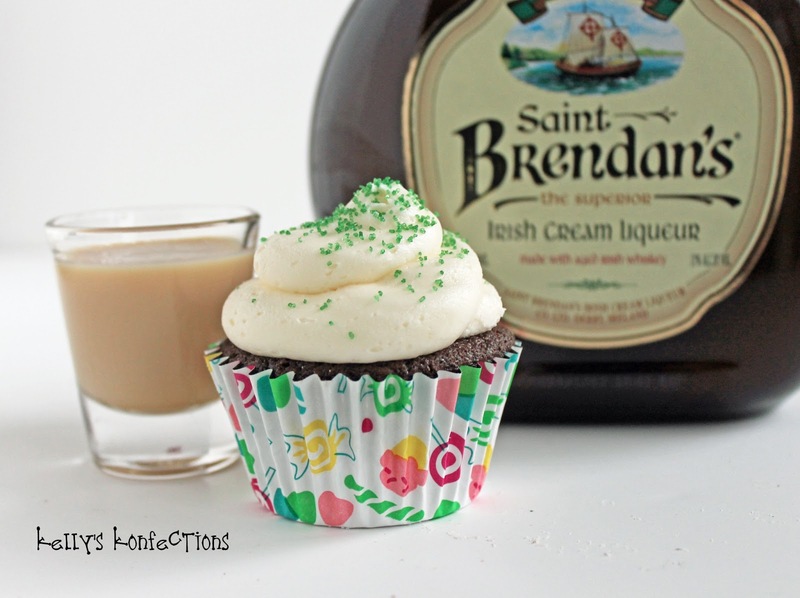 Drizzle in the irish cream and beat until combined. 3. Switch to whisk attachment and beat for 1-2 minutes, until the volume has increased slightly and the frosting is fluffy. 1. Pulverize 3/4 c of the pretzel rods in a food processor until very fine. Crush the other 3/4 c, but not as finely as the first chunk. 2. Place 1/4 c plus 2 tbsp. Guinness in a medium saucepan. Set aside. 3. Pour remaining Guinness in a small saucepan and bring to a simmer. Cook until reduced to 1 tbsp, about 15-20 minutes. Keep an eye on this because once it's reduced it burns quickly. 4. Chop the chocolate into pieces and place in the medium saucepan. Set over medium heat and let stand until the chocolate starts to melt. Stir (gently) with a wire whisk to blend together. 5. When the chocolate is melted and smooth, begin to add butter 1 tbsp. at a time. Whisk gently, then add the 1 tbsp. Guinness reduction. Stir in pulverized pretzels. 6. Refrigerate mixture until firm (or overnight). 7. When the mixture is firm, line a cookie sheet with wax paper. Scoop out ganache by heaping tablespoon and quickly roll between your hands. Store in an air-tight container in the fridge. 8. When ready to serve, roll the truffles in the crushed pretzels. These cupcakes were a bit crumbly when I made them, so scooping out the middle was difficult- be careful! Scoop out the middle (save the tops!) and stick a truffle in. Replace with the tops, and pipe with frosting.